Another one I'm surprised hasn't been reviewed yet. Pretty much all of the other standard Stone brews have been covered, but I guess this one fell through the cracks. 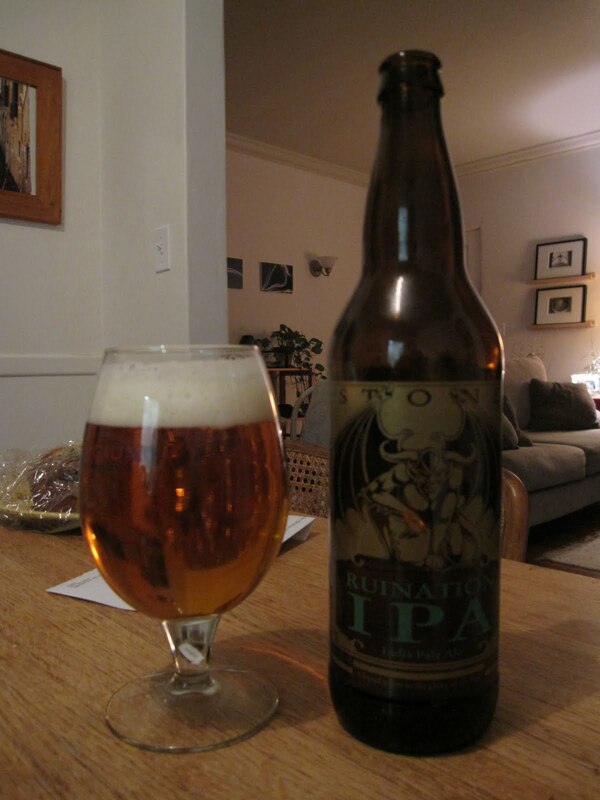 One entertaining thing about Ruination- this is really a double/imperial IPA, but they make no mention of that whatsoever on the bottle. So poor bastards who are expecting a 65-70 IBU IPA when they buy this (and don't notice the 100+ IBU note on the bottle) get steamrolled. Seriously, it's beer. No need to put some self-fellative treatise on the back of the damn bottle. Just let the beer speak for itself. Know what? I'm surprised. I've been of the mind that malty IPAs are generally East Coast style, and the grassy pine bombs are West Coast (well, more specifically SoCal, because all of the Pacific Northwest IPAs I had were super malty). But here's one from Stone, which many would consider San Diego's flagship craft brewery and one of the archetypes of the West Coast style, and it's pretty malty. I guess I should expect that, given that enhanced malt oomph is a regular component of DIPAs. I'm a bit thrown off by it, though, given that Stone is known as a bunch unapologetic hoptards, because I get malt and hop notes in almost equal proportion in the nose. And the flavor follows along in stride- I get malt right up front, followed by a big hop punch, and then both on the finish, though the hops definitely win out on endurance. Actually, this is really similar to the Nogne O Two Captains I did before this. Except in this case, the hops are able to overcome the malt to a fair extent, so there's some nice citrusy complexity. All told, I like it and would definitely buy it again, but there are some that outclass it. This is definitely a beer that illustrates to me how my palate's changed. Because I actually find this pretty approachable rather than ruinous. I guess that's why the days of brown ales have gone by the wayside. This is a review for the books. I'm proud of you Dad. Will Ferrell rules beer commercials.